Your cat needs playtime but cats have different personalities and finding the best cat toy could be confusing. There are different types of cat toys out there, each offers unique benefits. 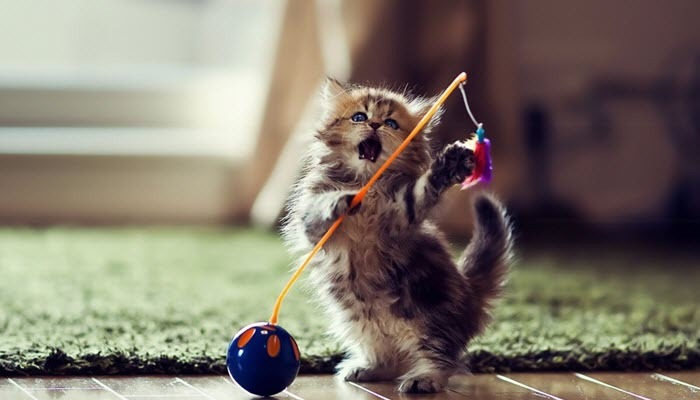 Toys could help your kitty exercise and they’re also great for stimulating their minds. Playing is not an optional activity for pets. 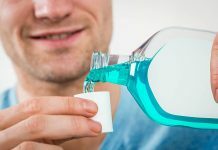 It may seem like a not so important activity but it’s actually essential to keeping them happy and healthy. According to veterinarians, here are some examples of the importance of playtime in cats. Toys can also help your cats relieve stress and anxiety. If you don’t know how a stressed cat acts, you may want to check out these signs that your cat might be stressed. So which toys are good for you kittens? It also depends on their chewing habits and what their interests are. The number one toy on our list is the Fashion’s Talk Cat Toys Variety Pack. It is a set that includes 20 assorted toys. You can play with these toys with your cats or leave them to keep him busy when you’re not at home. 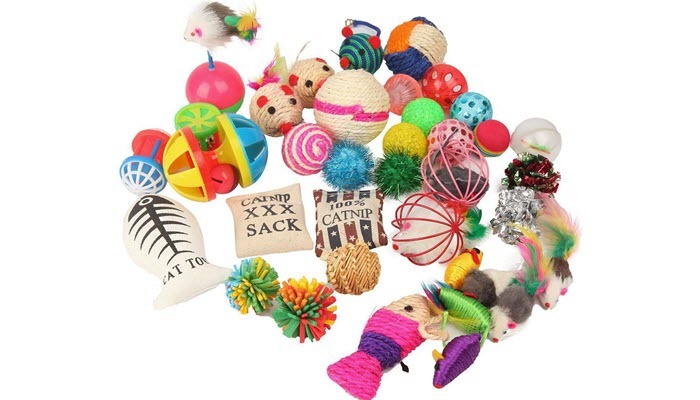 These toys will help your kitty release energy while having loads of fun. The toys include catnip, feathers and balls, some toy mice and more. They come in different attractive colors that your cat will love. Our second choice is the Pet Zone Fly By Spinner Interactive Cat Toy. It features a lifelike animated butterfly that flutters and makes sounds. It spins to stimulate your cat’s natural instincts to chase the butterfly around. This toy encourages physical activity in your cat and would give him a good workout. It’s a great way to keep him from being bored and satisfy his natural needs to hunt insects. 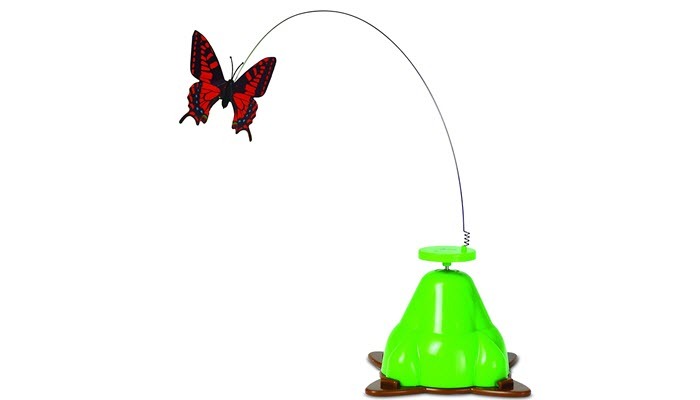 It has a really nice glossy green base and the butterfly is brightly colored so your cat will be stimulated. This is an effective way to increase mental stimulation for your kitty. 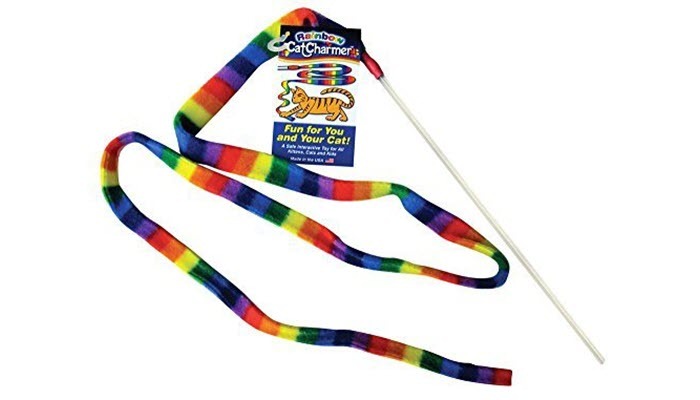 Your cat will also like this Cat Dancer Cat Charmer Wand Teaser Toy. This is great for interactive playtime. Use the wand to let your cat chase the toy that is made of a very colorful fabric. Your cat will enjoy running around trying to catch it. It provides excellent aerobic exercise and is suitable for cats of all ages and breeds. 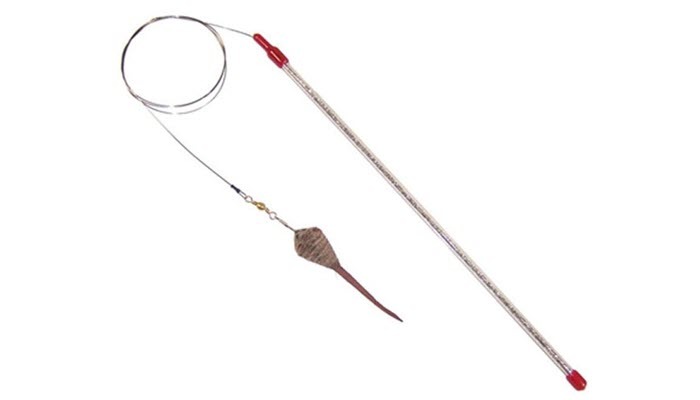 The wand is made of polycarbonate material so it’s durable and lightweight. This cat toy is available in different attractive colors. You should also consider the Go Cat Catcher Wand. One thing that cats would really love about this toy is that it has a cute little toy mouse at the end. The mouse is attached to a flexible braided wire and connected to a brightly colored glitter wand. This toy is great for interactive play and encourages your kitty to exercise. It has been recommended by veterinarians to exercise cats. You and your cat will have loads of bonding time and fun. Another great alternative is the Smarty Cat Skitter Critters. 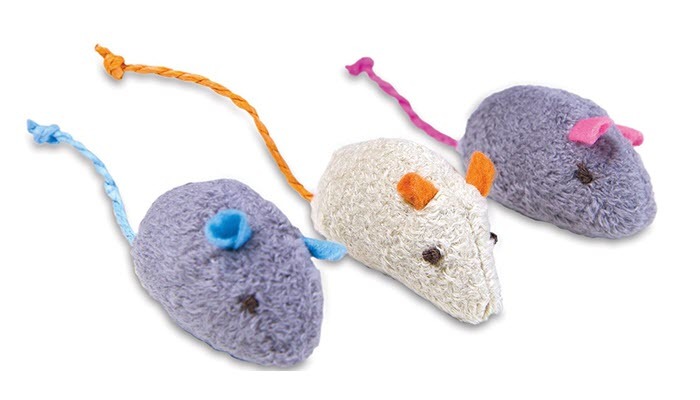 This is a set of three adorable toy mice with catnip spikes which your cat will love to nip on. The catnips allow your cats to release a burst of energy and then mellow down playing with the toy. These potent catnips are free from harmful chemicals and pesticides, and the fluffy fiberfill is spun from 100% recycled plastic so it’s safe for your pet. A disadvantage of the toys is that it’s not very interactive but you can leave it with your cat for him to enjoy playtime on his own. A really affordable option is the Kong Refillable Catnip Cat Toy. 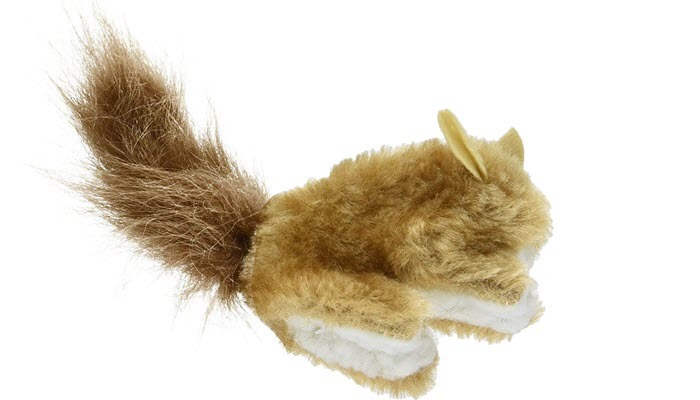 Your cat will love the soft and snuggly plush toy squirrel which includes a little pouch that allows you to put fresh catnip inside. It’s refillable so your cat will enjoy unlimited catnip playtime. This toy is made from high-quality materials, free from elastics, strings, or exposed bells. The set already includes the potent catnip. It’s also easily washable so you can keep it clean at all times. Cat toys encourage your feline creatures to develop their physical and mental abilities. They come in different shapes and sizes. Basically, you should choose your cat toys depending on the activities that your cat likes and their habits. Cats also have scratching instincts and this list of the best cat scratching posts would be very useful. Some cats though not all, chew a lot. If your cat has this chewing habit, you should choose toys that are soft and plush but probably not the ones that have small items that they can accidentally ingest. For these types of cats, it would also be great to give them toys that have catnips. Catnips can also relax some cats though some react differently. So make sure to test their reactions to the catnip first. Some toys are naturally attractive for kittens like balls and feathers. These are items that cats love to play with. What’s great about these toys is that you can just leave them with your cat even while you’re away and they will surely keep them from being bored. Interactive toys motivate your cat to be alert. It also gives the two of you lots of bonding time. Your cat will have a lot of fun playing with you. Examples of these toys are the cat teasers, usually a wand that has an attached toy at the end which your cat can chase. Some cat toys are electronic and offer loads of fun for your cat. These are usually battery operated and include an attached small item that your cat can run after and chase around. This is good if you’re busy during the day and don’t have time to wag an interactive wand around. Always make sure that your cats are supervised when they play with toys that are not recommended to be played alone. Ensure the safety of your pets, first of all, check our take on the best cat collar.